Me, blowing out some birthday candles on the most delicious carrot cake with cream cheese buttercream at a little cocktail gathering at Madam Geneva. Minus the crazy hours I was working as a bean counter, February had lots of toasting in store. I celebrated my golden birthday (they really do have a word for everything, don't they?!) with Erin, my oldest bestie, whose own golden birthday was the day before. Not only were our two birthdays in February, so were my mom's and Lisa's, my other BFF. Mix that in with Chinese New Year and Valentine's Day, and my life as a morsel marauder couldn't be any easier. 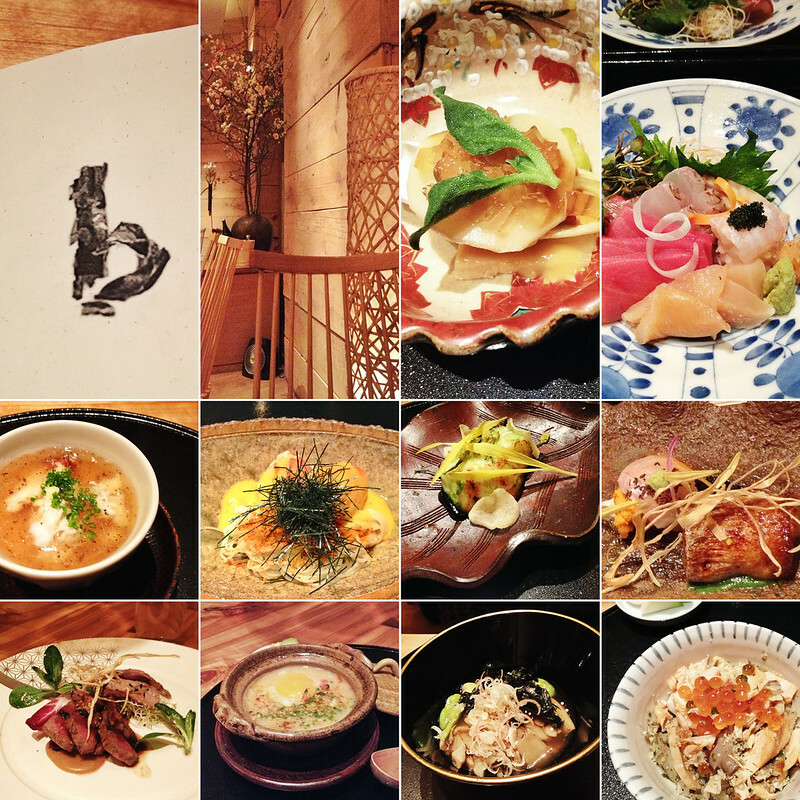 I cannot wait to share the extraordinary meals I had last month -- arguably three that easily make it into the roster of the best meals of my life (not something I can say lightly about any given meal, let alone three!). 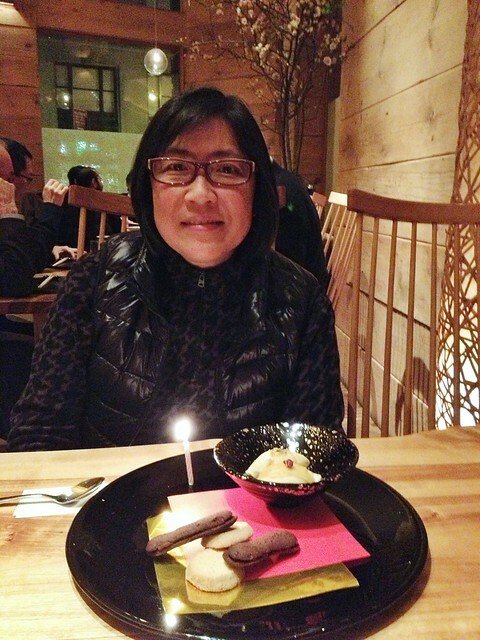 On the first Saturday in February, Marcus and I took my mom out to Chef David Bouley's Brushstroke to celebrate her birthday a wee bit early because my work schedule at the end of the month would've proved to be quite unpredictable and consuming. It was one of those meals where I consciously left my DSLR at home with a point to just enjoy the company of my lovely mother and my better half over the kaiseki cuisine we planned for dinner -- best decision! I got to enjoy every last bit of the meal as the favorable light of the table proved to make quick iPhone shots clear and bright. We opted for the six-course winter tasting menu (as opposed to the eight-course winter kaiseki menu) which was shorter but still had many of the highlights and options as the kaiseki, in addition to the many pretty much "tailor-to-your-own-liking-and-preference" supplements along the way. The six course included two starting courses, sashimi, a choice of a fish or meat dish, a choice of rice dish, followed by a dessert from the menu. The reason we brought her here this year was because she loves Japanese cuisine and prefers clean, simple flavors (essentially, not too much salt), so Brushstroke proved to be an instant winner with her, which let me just say, is a hard feat to accomplish. 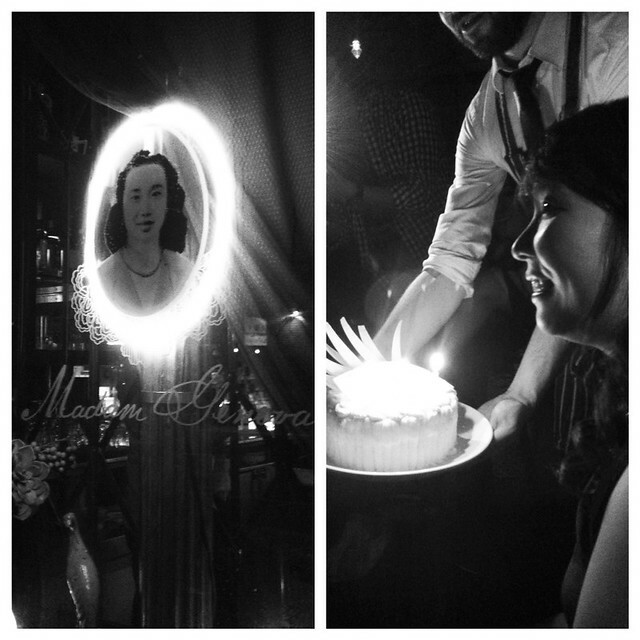 Also, Marcus and I had such a surreal time the first time we came here for our first anniversary (incidentally also the opening day for the restaurant) that we knew that same spark that won us over nearly two years ago would work its magic on my mom. With Valentine's Day around the corner, even though Marcus and I don't like to make a big fuss about the over-commercialized holiday, we see it as a nice excuse to go out, trying a new restaurant, and enjoying a nice meal together. The catch? We NEVER go out on the actual day -- cranky waitstaff, subpar food, and ridiculous crowds aren't our thing. We always make it a point to go out the weekend before, which is what we did. Just a disclaimer though -- in the three years we've been together, the times we've attempted this "Valentine's Day" dinner, we've both always gotten sick from the food or had a horrible time -- Marcus seems to think it's in the way we're choosing restaurants (which I will have to agree). 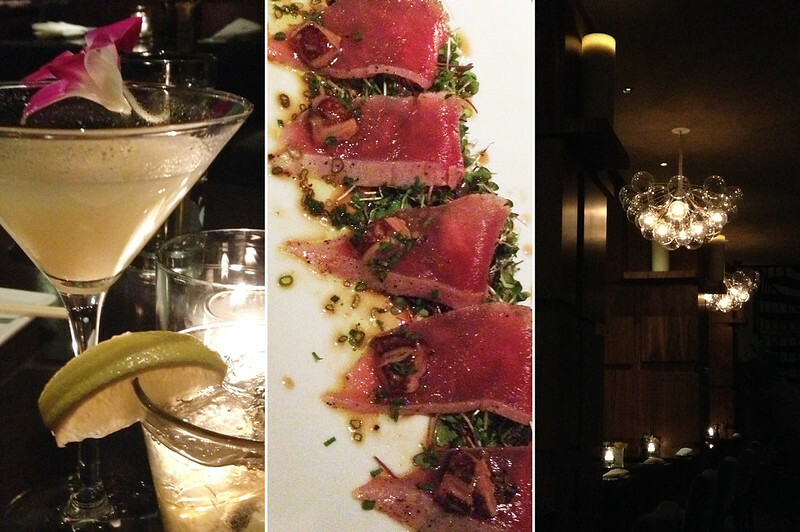 So this time around, we were cautious not to do anything too crazy: we chose Tori Shin in the Upper East Side based on our mutual love for simple Japanese cuisine and the casual ambiance it had to offer -- just like any other date night. It turned out to be a successful choice, so I'll be reviewing it in a separate post to follow in the next week or so. Marcus and I made ressies for the last weekend in February to celebrate my twenty-six years at The Modern: Dining Room. I have been to The Bar Room at The Modern quite a few times, but was never able to make it to the dining room, so I thought my birthday would be the perfect occasion to check it out. I almost feel guilty saying this, but I may have found my new favorite restaurant in the city here (sorry, Eleven Madison Park!). We loved absolutely everything that was served to us, down to the last morsels, remaining drops, and leftover crumbs. You can say we licked our plates clean (as well as we could with the restrictions of fine dining etiquette, that is :P). You can bet your bottom dollar that a post is in the works! A big thank you to Marcus for making my birthday this year so spectacular -- I love you more than words can say! The last few years, I haven't made a big deal about my birthday or anything (just a nice meal with Marcus was more than enough celebrating for me :P), but turning twenty-six years of age on the twenty-sixth (of February) only happens once, so a few friends met up with me at Madam Geneva (right next to Saxon + Parole) in NoHo for an intimate celebration over libations and banter. I first stumbled upon it when I saw Alice's shots in Serious Eats: New York for its coverage of the cocktail bar. It was the photograph of the signature punch that tipped it over for me. I had to celebrate here. An awesome surprise came that very evening when the bartenders told me that a jazz band would be playing throughout the evening -- what a totally crazy bonus that I couldn't ask for a better ambiance than that! Also didn't realize until later on that the name Madam Geneva comes from the eighteenth century English term for gin (i.e., the focused spirit at this cocktail bar). What a gorgeous space it was and what a helpful and hospitable service team they have there (if you happen to be coming here for a drink, be sure to ask for Rich or Tim!). I highly recommend working with AVROKO Hospitality Group for any private events you may have on the horizon -- they are fabulous and so easy to work with! Findings: I am so unbelievably lucky to have such great family and friends in my life that made February (however grueling) that much more special to me. I love you all :) here's to another great year ahead! Cannot wait to share the details of these February meals in further detail! Price point: $85 per person for the winter tasting menu at Brushstroke with an additional $22-48 for each supplemental dish; $14 for each cocktail and $28 for each starter at Koi SoHo; $60 for each bowl of Madam's Punch at Madam Geneva. :) february was awesome! love you!